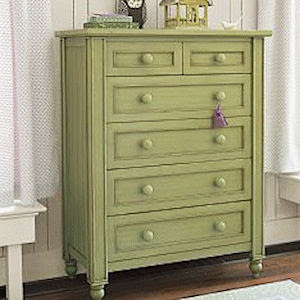 To achieve this look I purchased a used set on KSL which consisted of a desk, chair, nightstand, and dresser for $70. The set was around 20-30 years old, dark wood stain, formica brown tops, and had been painted several coats of white paint on top of that which was dinged up and chipping. I stripped it, sanded it, and added new wood round knobs ($10) http://www.homedepot.com and farmhouse style bunn feet ($68.55) (http://www.tablelegs.com). After preparing it for painting ($25 - Benjamin Moore Color color matched to Kilz at Wal-Mart) I sent it off here http://www.the-chic-life.blogspot.com who refinished them all for $225.